This is a very easy and light salmon recipe that is perfect for dinner. I used 2 tablespoons of light mayonnaise but feel free to omit it. I would cook for a very short time next time and check the doneness of the salmon frequently. It really only needed 8 mins. to roast , and about 3 minutes with sauce on it under the broiler. You can always brush a little more sauce after it is cooked. You’ll just want salmon to be cooked through perfectly–not over and definitely not undercooked. I used a silicone brush to put sauce on salmon and was left with a lot of sauce so I served on the side. Don’t be afraid of the mayonnaise because you really only use such a small amount on the fish itself. The lemon and garlic give it another layer of flavor in addition to the mustard/maple flavor. 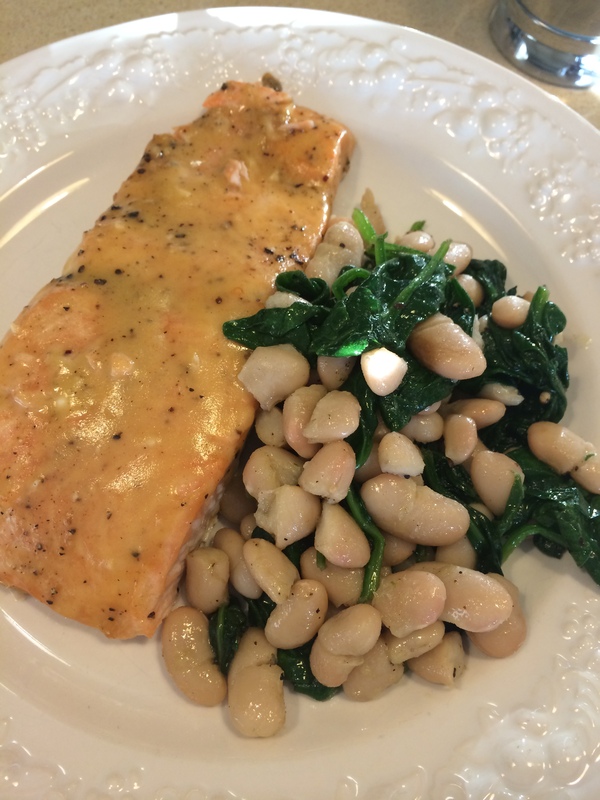 This is so easy and try the White Beans and Spinach to serve with it. 1 1/4 pound wild salmon, cut into 4 pieces , I leave the skin on but if you’d like you can remove it. I cooked with skin on but skin stuck to the parchment paper anyway. Place salmon pieces on a sheet pan with parchment paper or aluminum foil. Rinse and pat dry the salmon fillets. Season fish with kosher salt and freshly ground black pepper; be liberal with salt. Put in oven for 8-10 minutes. 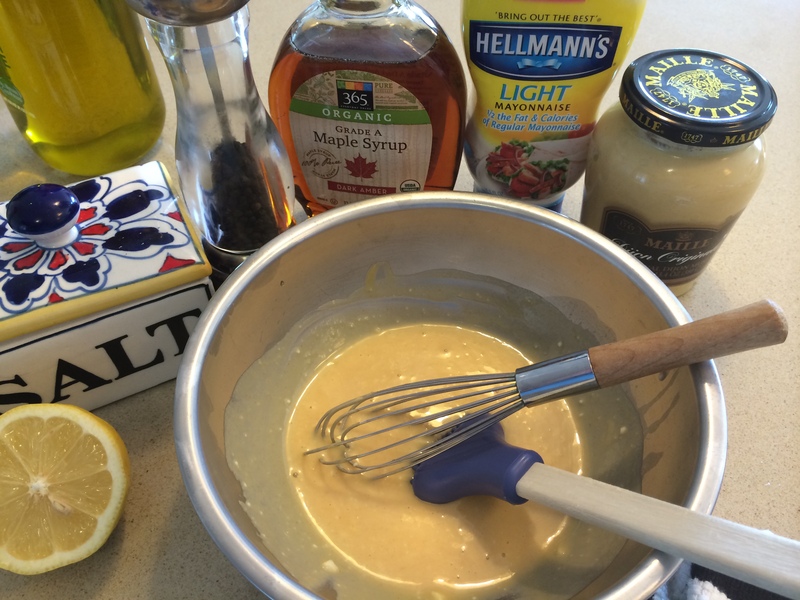 In a small bowl, combine mustard, mayonnaise, maple syrup, garlic and lemon juice. Whisk or stir very well to get rid of lumps of mayonnaise. After the first 8-10 minutes of cooking, brush salmon with mixture and return to the oven for approx.3 – 5 minutes under the broiler or until salmon is just cooked through (which will also depend on the thickness of your salmon pieces.) I let salmon sit for about 5 minutes before serving. It will continue to cook for a few minutes after it is removed from oven. Cooking times will vary depending on size of fillets and your oven. In my oven it was 8 minutes to roast and 3 minutes under the broiler. You can play around with these times depending on your needs. Total cooking time was only 11 minutes! I served with a side of delicious white beans and spinach , and for Joel some roasted butternut squash . Rice is always perfect with fish.